Having attended several workshops for teachers, I have noticed a pattern: that an initial formality between participants quickly gives way to laughter, sharing, and deep bonding. This has led me to think about how attending workshops or seminars on education can benefit teachers, ultimately leading to an improvement in the way learning occurs in our schools. Subject and methodology: There is of course, the obvious benefit. If a teacher attends a workshop on a particular topic, he or she will gain knowledge about that topic and how to teach it. 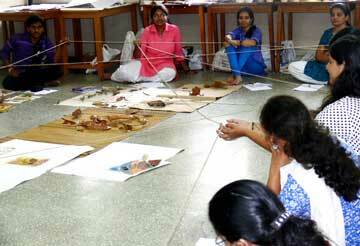 So, a workshop on Montessori mathematics, for example, will impart insight into teaching maths to youngsters. Besides this, participants can take a cue from the methodology followed by the resource person while conducting the workshop. At one of the workshops I attended recently, participants had to write poems, and then read these poems aloud to the rest of the group. Instead of asking participants to merely read out their poems by turns, the resource person made them sit in a circle on the floor and handed one participant a ball of string. The participant read his poem aloud, then holding on to one end of the string, he tossed the ball of string to another participant across the room. Each participant read his or her poem upon receiving the ball of string, passing it on at random after that. This was called the Web of Poetry and it gave a ‘fun’ feeling to reading poetry. Besides, all participants had to be alert throughout, since they did not know when the string would come their way! Many of them realized that activities like read-alouds can be livened up by creating a game-like feeling in the classroom. There was a lot of merriment as the web of poetry was created across the room. Informal atmosphere: Such an informal atmosphere is a rare treat for teachers, who are constantly playing a role, needing to set an example for students or interact officially with parents or management. Even in the staff room, teachers are usually busy with corrections, lists, timetables or other work, leaving little time for peer-to-peer interaction. In such a scenario, sharing a relatively relaxed space with their peers leads to a breaking of the mould – they see things differently, and come up with new solutions to their problems. In particular, it is interesting to note that at the beginning of almost every workshop, groups of teachers from the same school tend to flock together. With some urging from the facilitators, they soon mix with teachers from other institutions, and then the sharing is incredible to see. Most of all, teachers realize that there are others experiencing the same triumphs and trials as them, creating a warm community feeling. Hidden talents: Within this community, teachers often discover some hidden talents. I can state this from personal experience. I consider myself to be musically-challenged to the point that I avoid joining even the ‘Happy Birthday’ chorus when I attend a party. At a workshop, I was encouraged to sing. While my voice is nowhere near melodious, I realized that I can carry a simple tune and that singing can be fun! My initial shyness with regard to my singing also gave me an insight into what my students go through when I push them into attempting something that I am expert at, but they may be trying with trepidation for the first time. Above all, I feel that gaining new knowledge and meeting other teachers leads to rejuvenation, a renewal of purpose. In the day-to-day hurly burly of school-home-school, it is easy to get caught up in petty details and forget that teaching is a great profession – that it is all about moulding minds, and, in our own little way, shaping the next generation. Taking a step back and going from being teachers to being learners reminds us of this purpose, reminds us why we become teachers in the first place.